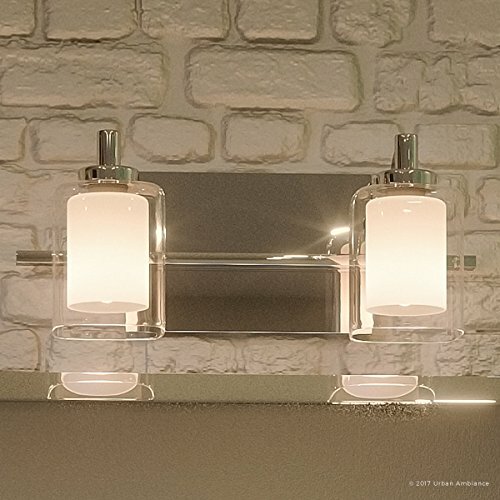 Medium in size and forged in a Modern style, its linear design is both graceful and classy making it a frequently purchased fixture in the Urban Ambiance portfolio. A world-renowned wine region, Napa is classy but unpretentious. It's chic hotels, restaurants and wineries are the beating heart of the city. The Napa Collection combines modern with a classic look that creates an gorgeous collection, ideal for those with more discerning tastes. Made from high-purity steel-glass with our elegant Polished Chrome finish. Superior workmanship backed by a 10 year electical components warranty and a 3 year finish warranty (original purchaser). STYLE AND DESIGN INSPIRATION: Medium in size and forged in a Modern style, its linear design is both graceful and classy making it a frequently purchased fixture in the Urban Ambiance portfolio. A world-renowned wine region, Napa is classy but unpretentious. It's chic hotels, restaurants and wineries are the beating heart of the city. The Napa Collection combines modern with a classic look that creates an gorgeous collection, ideal for those with more discerning tastes. MATERIAL, FINISH AND WARRANTY: Made from high-purity steel-glass with our elegant Polished Chrome finish. Superior workmanship backed by a 10 year electical components warranty and a 3 year finish warranty (original purchaser).